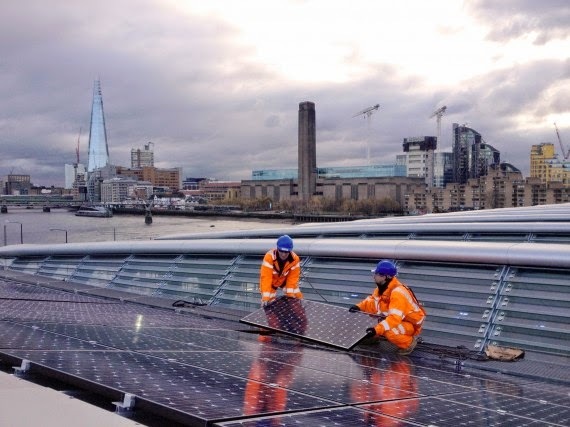 Solar panels are being installed at the world’s largest solar bridge, London’s Blackfriars Bridge. Photo credit: Solarcentury. A report carried out by London Assembly Member, the Green Party’s Jenny Jones, highlights that London is lagging behind the rest of the country in solar deployment. While the amount of generated solar electricity has doubled in the UK over the last year, London has seen the lowest uptake of solar panels of any region on mainland Britain. The report looks at the potential of solar and some of the barriers London faces. It recommends the formation of a dedicated City Hall team to help businesses, tenants and communities install solar on the empty roof tops of London’s commercial and industrial businesses, supermarkets, flats, schools, transport and public buildings. Only one in 260 London households have gone ahead with solar panels. The South West of England has eight times the rate of installation as London. London has the potential to supply a fifth of its electricity needs from solar PV. Wide variations in take-up rates between London boroughs. London borough Waltham Forest has one solar PV installation for every 88 homes, in neighbouring Enfield its one for 362 homes. 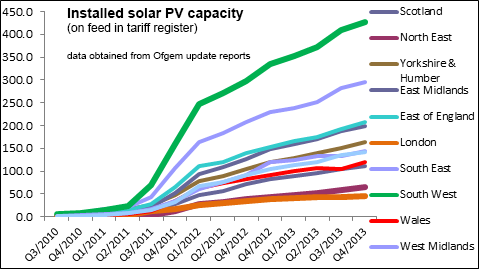 UK installed solar capacity. Photo credit: Jenny Jones. “Given that solar photovoltaics have the greatest potential of any renewable electricity generating technology, it is astonishing that the Mayor is not promoting and helping London’s residents, businesses, schools, communities to harvest solar electricity from their underused and empty roof tops. What Londoners deserve is an enthusiastic advocate of solar energy, a clean energy source that will not only cut our bills and our carbon emissions, but it will help address looming energy supply disruptions. What we don’t need is a Mayor fixed on promoting dirty ‘fracking’ wells around the country and all the inherent environmental hazards associated with them”. Jenny Jones who ran for London Mayor in the 2012 Mayoral Election, but lost out to the current Mayor Boris Johnson, who she has often criticised for his hostility to the climate change issue, in particular his statement that we should leave no stone unturned in relation to the extraction of shale gas in London. In the report she outlines he should have done more to encourage solar investment in the UK capital. Meanwhile one conservative Londoner, Michael Liebreich, who is a strong advocate for renewable energy and founder of Bloomberg New Energy Finance has not ruled himself out as a candidate for the London Mayoral Election in 2016. Liebreich who is a member of the Conservative Party, believes that the clean energy revolution is inevitable and believes in the free market solution to achieve this, a market model with less regulation.